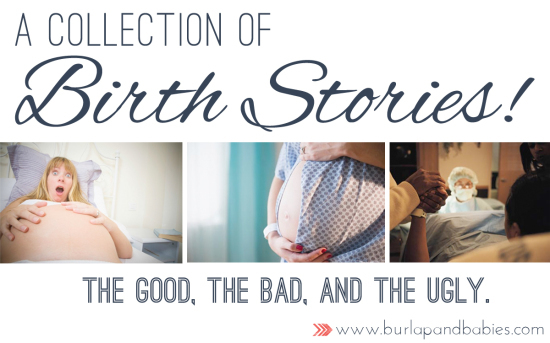 Alright friends….are you ready for part three in our collection of birth stories? If you missed Monday’s post, you can read all about a fast, quick delivery that everyone dreams of from Dwelling in Happiness. Yesterday’s post was a nice compilation from Home Again Jiggety-Jig and her five births. Today’s birth story comes from Whitney at Adventures in Mommyhood, who just happens to be from the same city as me and delivered at the same hospital I would be at if I weren’t delivering at a birth center. Small world! Whitney is sharing with us her three part birth story of how her adorable little girl, Garrity, came into this world. Whitney’s birth did not go as planned but it shows the unexpected side of things through needing to be induced and I love her honesty in all the details. Going into this birth I didn’t have a plan. I had some preferences but no hard and fast rules. I knew that I wanted to try and do this thing as natural as possible to an extent. Did I think I’d ever have a completely natural birth with no epidural? No. But I wanted to try my best to get as far into labor without drugs and only use them when I felt like labor wouldn’t be stalled by getting an epidural. I also really wanted to avoid the use of pitocin to induce labor. I know many people are induced with it with no side effects but when my mom had me she was induced with pitocin and lost all of her hair which at the time, the drs attributed to a reaction to the pitocin. Later she would be diagnosed with Alopecial Universalis which is a autoimmune disorder and the chances that it was related to pitocin slim, but because I have Androgenic Alopecia I was very nervous that I could end up in the same situation as my mom. I also was adamant that I would not use any drugs that could cross the placenta. I’ve actually never heard of anyone needing narcotics along with the epidural plus I didn’t want to drug my baby. So now that you know what I wanted, let me take you on a little journey and tell you how Garrity’s birth turned out nothing like I planned. Thank you so much for sharing your story, Whitney, and being so honest! I love seeing how you just rolled with it and did what was best for you and your little one even though it was so against your plan. Hi Amanda, thanks so much for featuring my story! My birth definitely wasn’t what I planned but I got what I wanted in the end – a beautiful, healthy baby girl, and that’s all that mattered.